The Tennessee Secretary of State’s Office honored Tusculum University Thursday, Jan. 24. The university was a winner of the 2018 Tennessee College Voter Registration Competition. 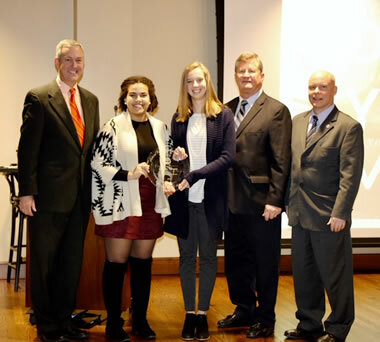 Pictured left to right are Secretary of State Tre Hargett, Tusculum sophomores Carmyn Tassone and Hanna Johnson, state Sen. Steve Southerland and state Rep. David Hawk. The photo is courtesy of the Tennessee Secretary of State’s Office.